I attended the 8th Annual Firehouse Quilt Show on July 20, that was held at the events center in the Douglas County Fairgrounds in Castle Rock, Colorado. You can see the unique natural rock formation high on a hill, that helped to give this town its name in the photo above. The fairgrounds event space was large, and there were quite a few vendors and exhibits to see, as well as the award-winning quilts. 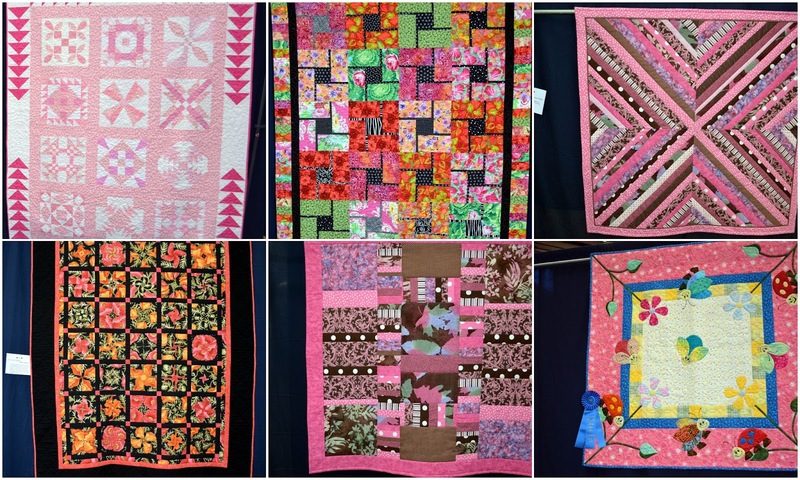 The show had many fabric, applique, quilt accessory, guest speakers, and other types of craft vendors and quilting classes. The quilts were all carefully hung with a solid blue backdrop, and labeled and judged in separate categories according to style, such as computer long-armed quilted, sewing machine quilted, hand quilted, appliqued quilts, art quilts, children's quilts--12 years of age and younger, and age 13 - 18, miniature quilts, plus a special exhibit of non-judged vintage and patriotic quilts. 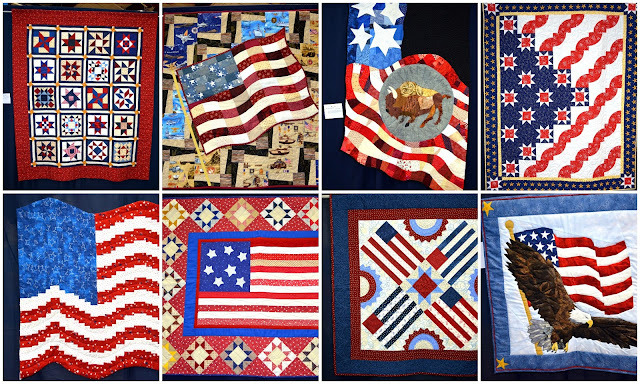 I am not a quilter, but I could certainly appreciate all the effort that goes into making these fabric works of art! 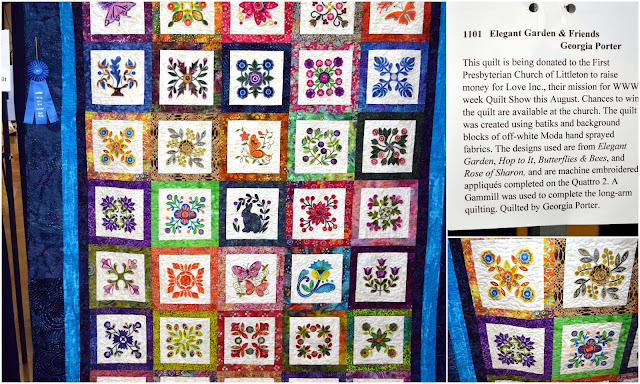 It was really enjoyable to walk around the hall and look at each and every one of the one hundred and fifty quilts on display. 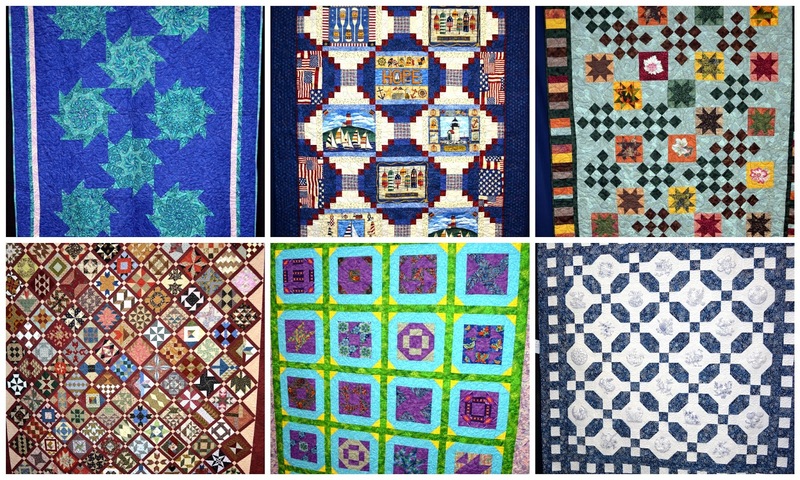 They were all so unique and a wonderful blend of traditional and modern quilting techniques. 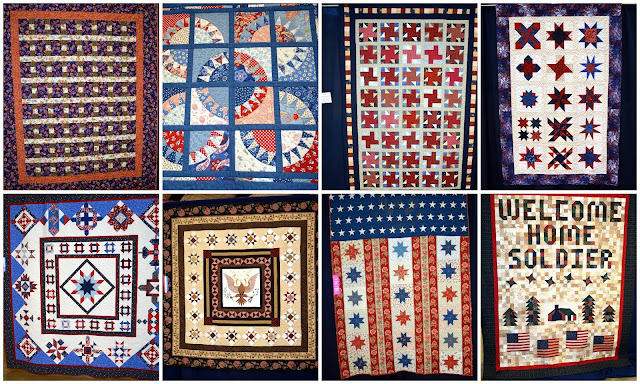 The varieties of patriotic quilts were especially amazing! The detail and amount of work in them was wonderful to see. 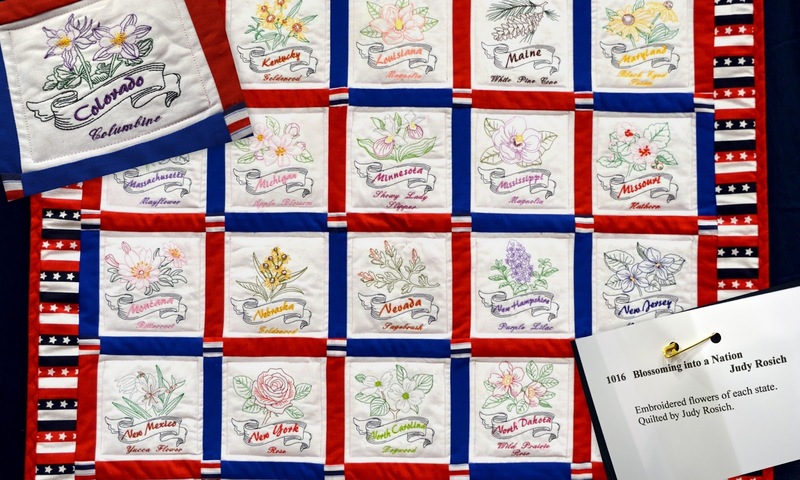 This patriotic quilt incorporates all 50 official state flowers. I made sure to show the state flower of my new state of Colorado--the Columbine--in this photo. 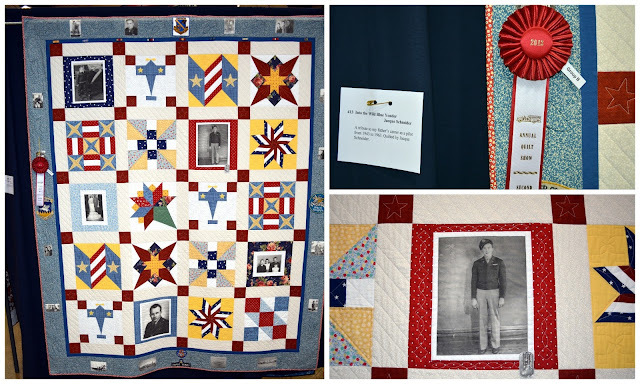 This quilter's ancestors was one of the signers of the American Declaration of Independence, and she incorporated his information, as well as information about every relative who served in the armed forces throughout our nation's history, in this very detailed quilt! 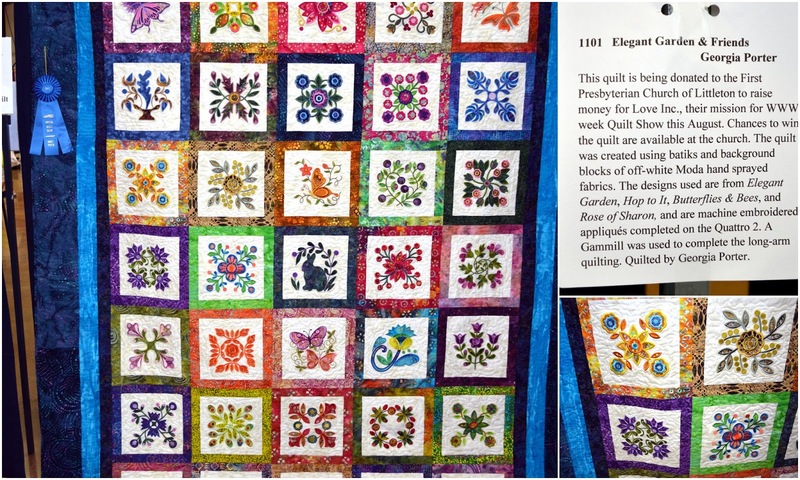 Make sure to click on to enlarge to see how even the back of the quilt is designed with information. 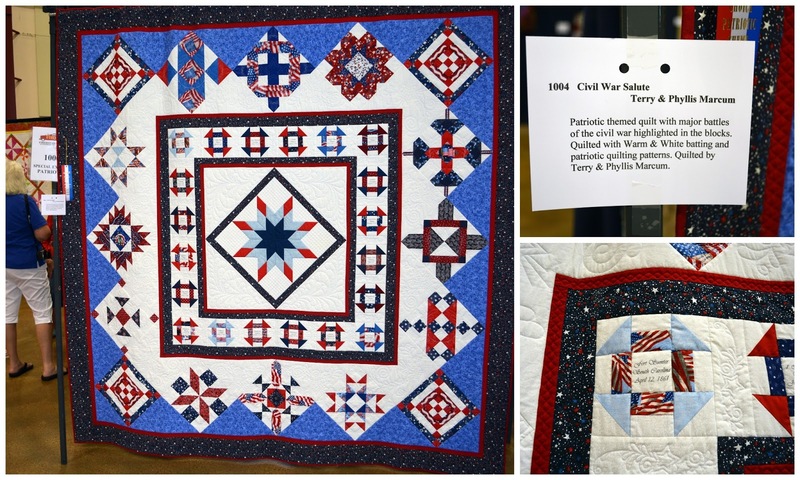 A tribute quilt to the Civil War, with each battle and date embroidered on the quilt. 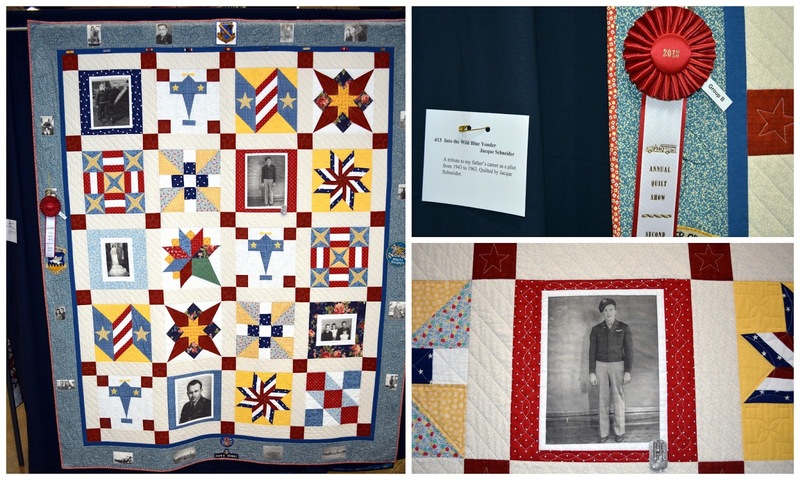 A very realistic quilt that honors the bravery of all firefighters. The quilts were professionally judged by a panel of quilt experts, such as Christine Brown--the former editor of American Quilter Magazine, Ellen Palmer--a member of the Colorado Quilting Council who worked as a judge in training for five years, and Teresa Rives--a prolific quilter who trained for three years to be judge for the Colorado Quilt Council. 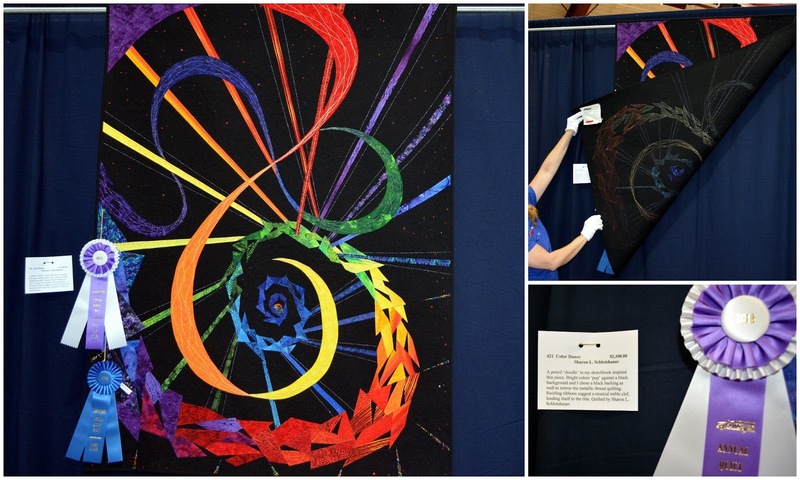 The unique quilt above was a "best of show" blue ribbon winner as an art quilt -click on a photo to read more about it. Another intricate "best in show" and blue ribbon winner computer long-armed quilt. 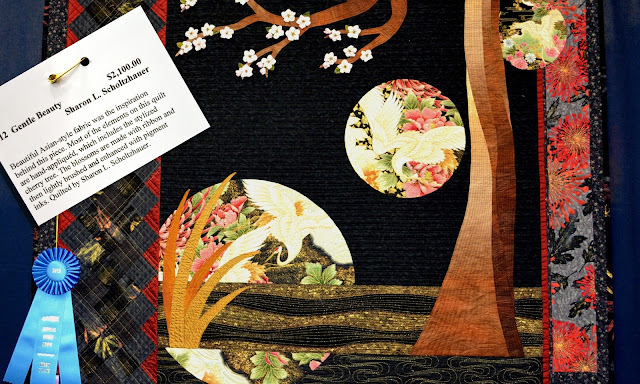 This Asian inspired blue ribbon winner appliqued quilt had many 3-D elements to it. 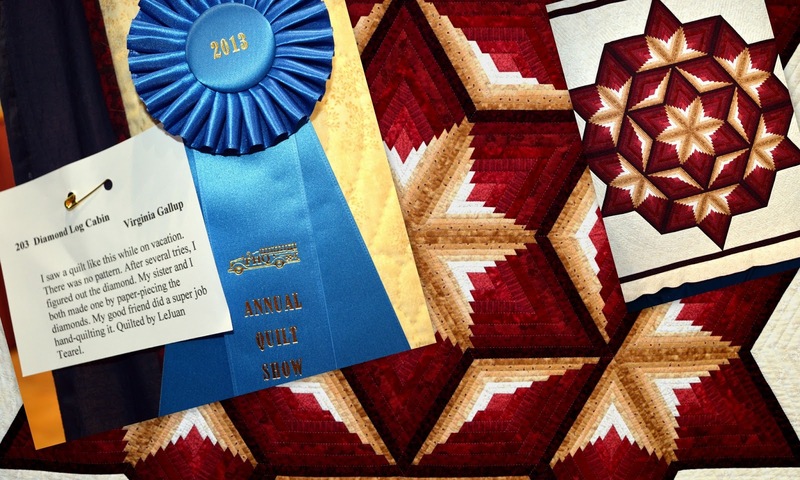 A blue ribbon paper piercing design quilt. 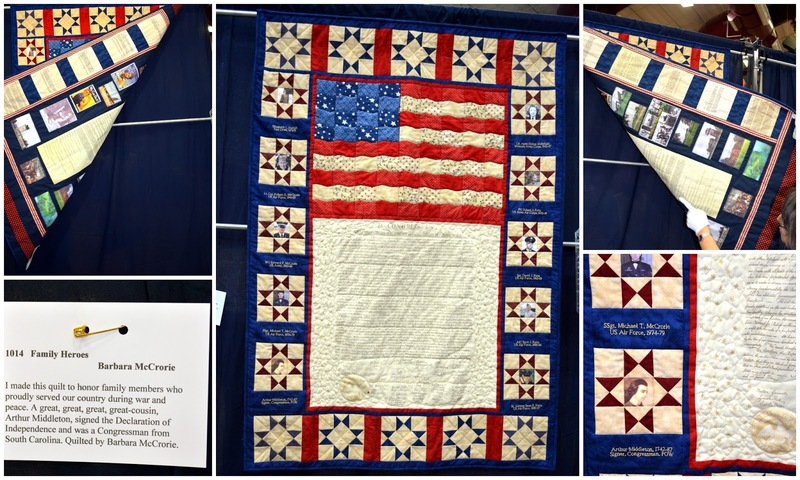 This gorgeous quilt was being donated for a special cause. The detail and colors in it were stunning. I can't possibly show all the quilts that were on display at the show in this post, but there were many in shades of blue....and many in shades of pink! ...and quilts of every imaginable design! 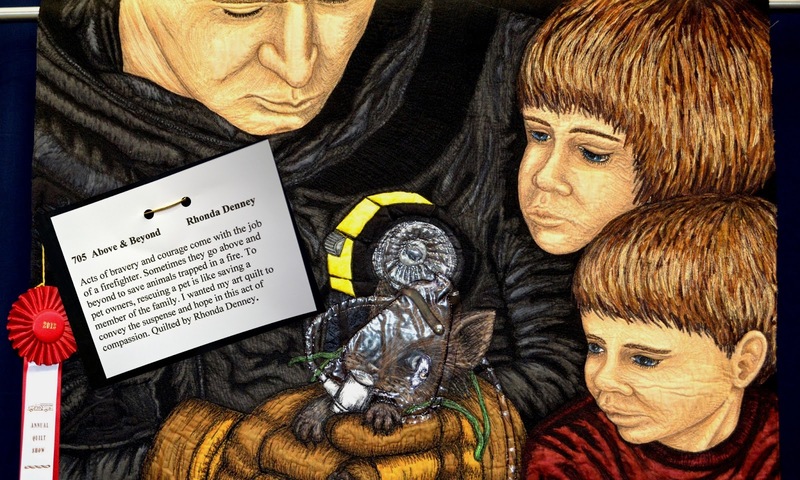 It was so interesting to read the story behind each one. 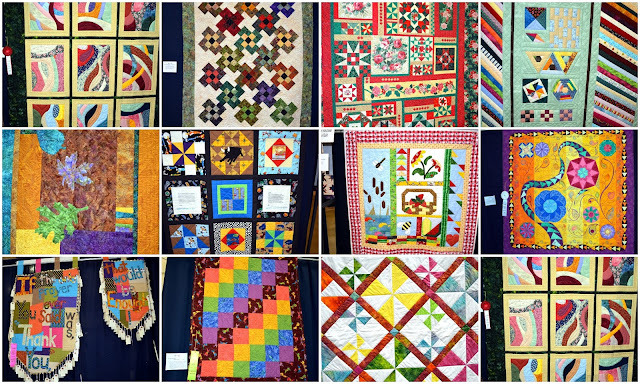 I really liked the vintage quilts and their stories. 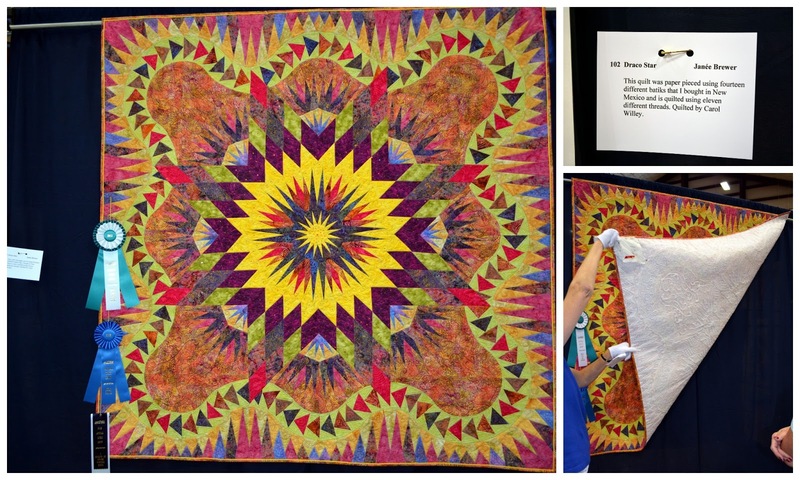 This quilt took 70 years to complete! This vintage quilt was from the 1880s and on sale for $750. There were even examples of quilted clothes, bags and minister scarves at the show. The Firehouse Quilts is a non-profit group of volunteers that makes and donates 45' square quilts to Colorado fire departments, Action Care Ambulance, Denver Health Medical Center, victim advocate offices, and twin/full sized quilts to Douglas County Women's Crisis Center to be given to children and their mother's in time of crisis. Each year they donate over 1,000 items! 90% are "snuggle quilts" for children that have been in an automobile accident, house fire, or even domestic violence in their home. 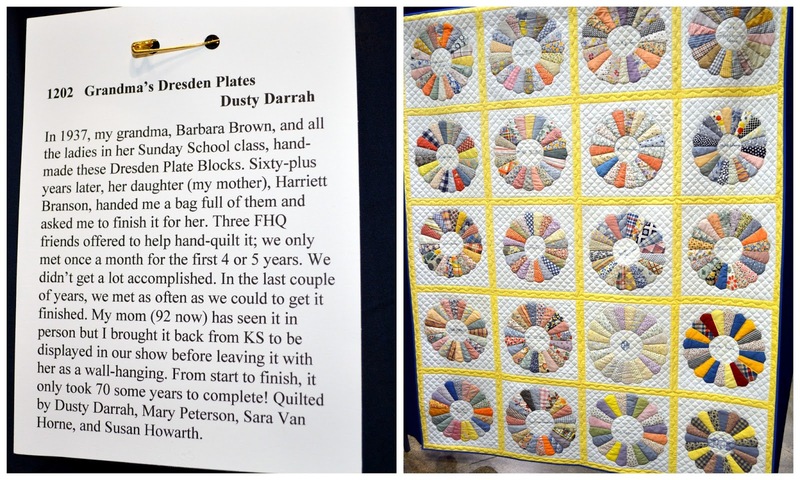 The Quilt show volunteers were doing a "bed turning" display above where they held up example after example of the types of quilts that are lovingly made and donated as "snuggle quilts" by their members. 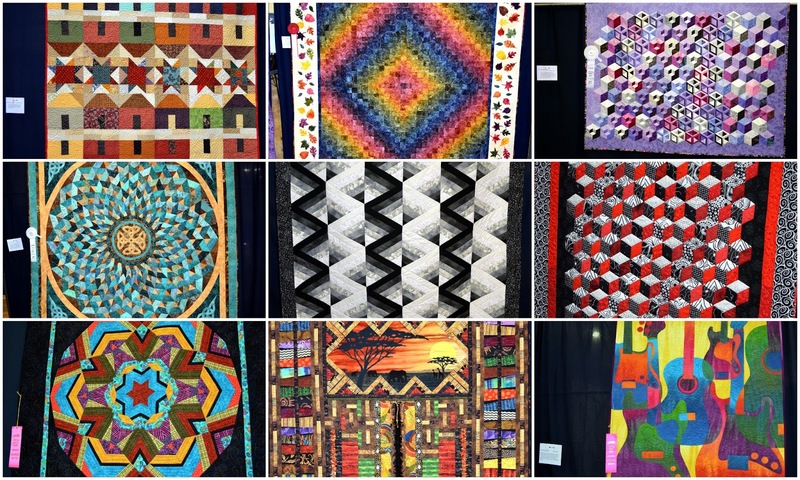 The Annual Quilt Show is their major fundraising event and all proceeds are used to help them purchase supplies and provide quilting education for their volunteers. It truly is a wonderful mission that they perform. I was happy to attend, and contribute what I could, to this truly wonderful event. I hope you enjoyed seeing a portion of the beautiful quilts that were on display and learning about this very talented and devoted quilting organization in Colorado! A Summer Day in Breckenridge, Colorado. My older brother, sister-in-law, and one of their grandsons visited us last weekend to attend my granddaughter's baptism. Their visit was short, and we wanted to give them a view of the Rocky Mountains before they had to return home, that they couldn't see from the Front Range foothills, where we live. 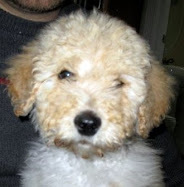 We decided to make a visit to Breckenridge, a little less than an hour and a half drive on I-70 from our area. Here we are approaching the Eisenhower Tunnel. The Eisenhower Tunnel --officially known as the Eisenhower-Johnson Memorial Tunnel, is a dual-core, four-lane vehicular tunnel approximately 50 miles west of Denver, Colorado. The tunnels carry Interstate 70 under the Continental divide in the Rocky Mountains. With a maximum elevation of 11,158 feet above sea level, it is one of the highest vehicular tunnels in the world. The tunnels are the longest mountain tunnels and the highest point on the interstate highway system. Completed in 1979, it was one of the last major pieces of the Interstate Highway system to be completed. The westbound bore is named after Dwight D. Eisenhower, the U.S. President for whom the interstate system is also named. The eastbound bore is named for Edwin C. Johnson, a governor and US Senator who lobbied for an interstate highway to be built across Colorado. One thing for sure, when you exit the tunnel westbound, the Rocky Mountain ranges loom before you! The descent of the road once out of the tunnel is so steep, that you don't have to give your car any gas to drive for quite a few miles. In fact, it is hard not to burn out your car's breaks by trying to slow down! There are multiple "runaway truck ramps" for trucks that are going too fast and can't slow down. We actually saw one truck on the side of the road a little further down from here, whose breaks were smoking from the descent! We entered Route 9 south on our way to the town of Breckenridge, located in Summit County, in north central, Colorado and the heart of the Rocky Mountains. Vail is 34 miles to the west, and less than 20 miles from Summit Country's three other ski resorts--Copper Mountain, Keystone, and Arapaho Basin. Founded during the "Pike's Peak Gold Rush" in 1859, the town became a ski resort town in 1961. Soon we found the town's "Breck Connect" Gondolas and parked in the town's free parking lot. You can see a billboard of the Breckenridge Ski Resort ski trails on the mountain at the gondola office. There are 155 ski trails accessed by 30 lifts. During summer the slopes are used for hiking, scenic chairlift rides, the "Super Slide" and mountain biking, among other available activities. My extended family and husband posed for a photo before we boarded the free gondola ride. The gondola ride offers spectacular views of the Cucumber Gulch Preserve on the way up to the Breckenridge Fun Park. The base elevation is 9,600 feet. The Fun Park has all kinds of activities to buy tickets for, such as mini golf, gemstone panning, "Gold Runner" coaster, super bungee, 4 X 4 truck rides, guided mountain biking, and the Alpine Slide. My brother, his grandson and my husband all decided to take a ride of the Alpine Super Slide. My brother and his grandson are on their way up to the top of the track with their slides. There are three different 2,600 foot long tracks and the riders speed down the mountain on a variety of dips and banked turns. You can see all three members of my family in this photo, about to cross the finish line. 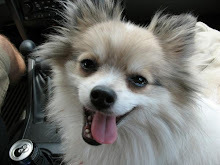 They enjoyed the ride very much! The average snowfall in Breckenridge is 300 inches per season, and there was still some areas of snow on the mountain! We all decided to take the scenic chairlift ride on the Colorado Super Chair to the 11,059-foot height, that promised picturesque views of the Continental Divide. ....quite a few times! My brother and his family were a few chairs behind us. Here we are approaching the top chair lift station. One has to hop off quickly as the chairs never stop moving. My brother and his family hopping off. As soon as we looked around we felt as if we could touch the sky! What a glorious place to be! I wore a fleece jacket as I thought it would be cool on the mountain top, but it was in the '70s. 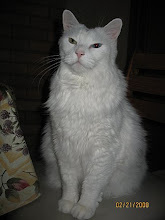 My husband and I are used to the high altitude, as we live at around 6,000 feet, but my brother and his family who live at sea level on Long Island, New York, did quite well and did not suffer any ill effects at all. The total height of the peak we were on was around 12,000+ feet, so we were about 900 feet below the top. Everywhere we looked we could see ripples of mountain after mountain. Some of the distant peaks were high above the tree line. There were views of "purple mountain majesty" on all sides. We decided to walk one of the trails that were on the slope. As we climbed higher the views became even more dramatic. 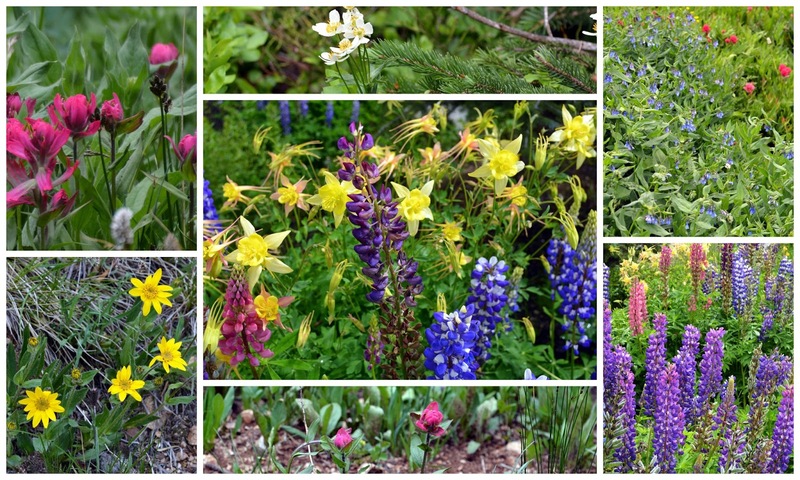 I enjoyed taking photos of the wildflowers I saw as I hiked. There were so many wonderful colors! The mountain only gets 30 frost free days a year, so the alpine flowers must be hardy. My sister-in-law walking on the trail. We began to notice that the clouds were getting darker, and we could hear thunder rumbling in the distance, so we began to hurry. As you can see in this photo, the rain was fast approaching. We ran back to the ski lift chairs but they were closed due to the thunderstorm, so we were taken down the mountain by the white, four-wheel drive van you can see in the photo. It was quite a bumpy and exciting ride along many unpaved roads! The mountains in the distance all but disappeared because of the storm. Gratefully, we made it all the way down to the base camp where we then boarded a bus that took us down to the parking lot. It continued to rain hard, and I felt sad that we could not explore the beautiful town of Breckenridge, but I know my husband and I will be able to return again someday soon. 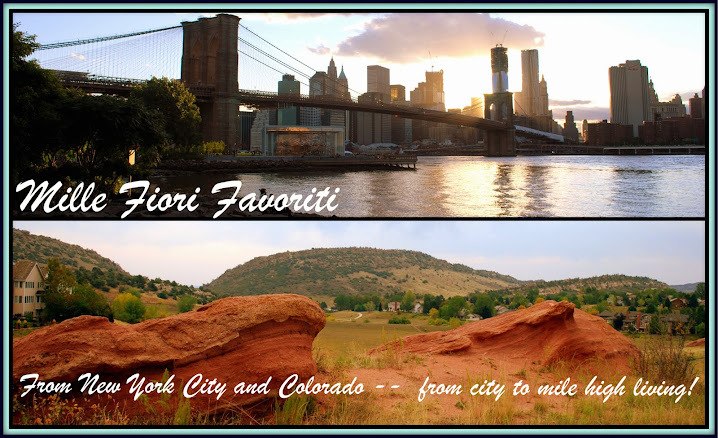 There is definitely more we want to see and do in this wonderful area of Colorado, and many more ski towns we hope to visit. We love our new state! 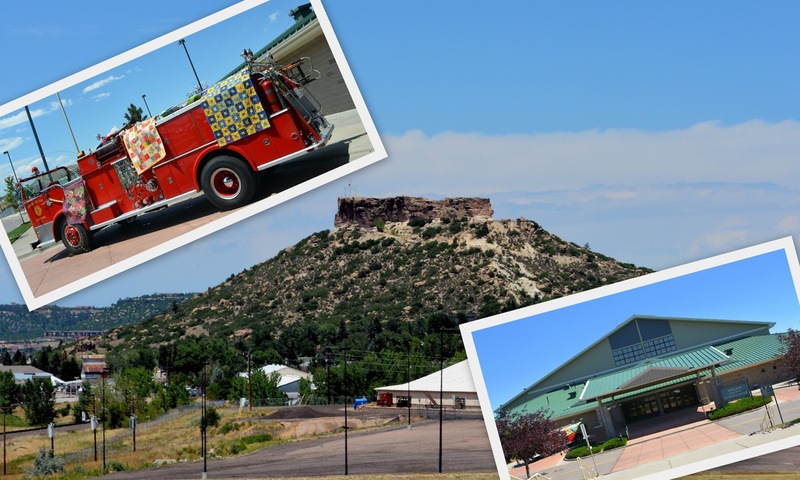 We might have traded high NYC buildings for high Colorado mountains, but we haven't lost the thrill of knowing there is so much to see and do! I hope my family is able to come back next time for a longer visit and see more with us. 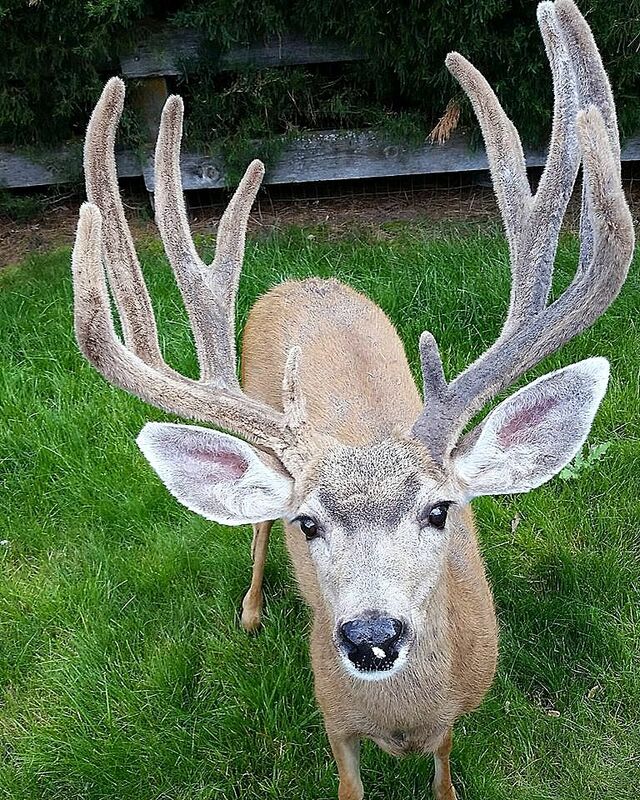 Have you visited Colorado? What was your favorite sight to see?